Click here to download Service Level Agreement in Pdf format. VLinteractive.com guarantees network uptime to be 99.5% of the time. This guarantee assures that all major routing devices within our network are reachable from the global internet 99.5% of the time. Scheduled Network Maintenance - occasionally network maintenance will be required. VLinteractive.com will do everything possible to minimize and avoid downtime during this maintenance. You will receive prior notification of upcoming maintenance at the main email address we have on file. Scheduled maintenance periods are not eligible for SLA credits. Hardware Maintenance - on rare occasions, the hardware in your Dedicated Server may need maintenance or replacement. VLinteractive.com will do everything possible to minimize any downtime in these situations per our hardware replacement SLA. Any downtime incurred as a result of this maintenance will not be counted towards our network SLA. Software Maintenance - an important part of managing a dedicated server is keeping the software up to date. If you choose to have VLinteractive.com manage your server, occasional software updates will be required to address security or performance issues. Usually you will experience little or no downtime in these situations, but we cannot guarantee a specific amount of time in all situations, as such any downtime incurred as a result of this maintenance will not be counted towards our network SLA. Malicious Attacks - if a third party initiates a "Denial of Service" or other form of disabling attack against your Dedicated Server or major portions of our network, VLinteractive.com will do everything in its power to stop the attack, but cannot guarantee a resolution time. Part of the resolution process, may require disabling or turning off your server. Any downtime incurred as a result of these types of attacks or their resolution will not be counted towards our network SLA. 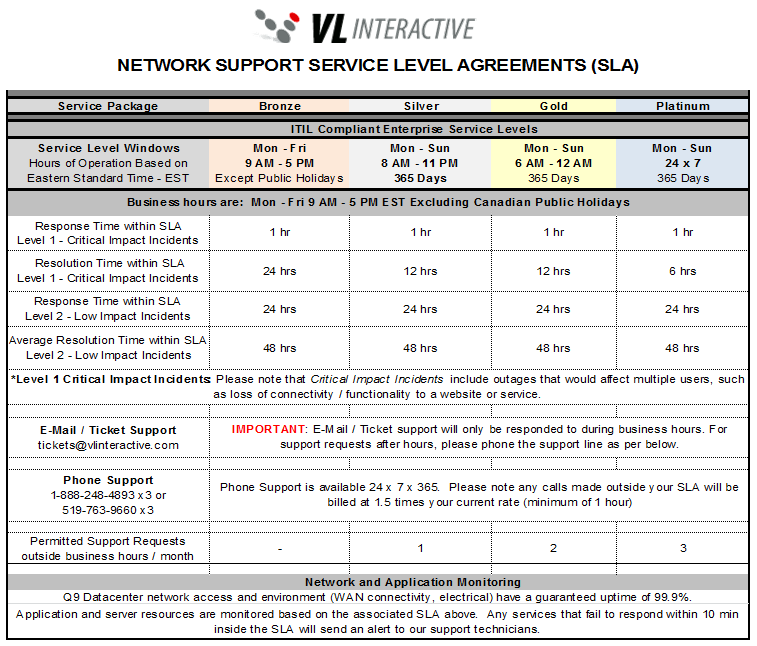 In the event that VLinteractive.com does not meet this SLA, Dedicated Hosting clients will become eligible to request compensation for downtime. The customer will receive a credit for 5 times ( 500% ) the actual amount of downtime. This means that if your server is unreachable for 1 hour more than the allowable 0.5%, you will receive 5 hours of credit. All requests for compensation must be received within 5 business days of the incident in question. The amount of compensation may not exceed the customer's monthly recurring charge. This SLA does not apply for any month that the customer has been in breach of VLinteractive.com Terms of Service or if the account is in default of payment. VLinteractive.com is committed to providing an exceptional level of support. We offer both Critical and non-critical support. All non-critical support will be answered within normal business hours, Monday-Friday 9:00AM-5:00PM EST, excluding any statutory holidays. Critical support will be handled according to the entitlements laid out in your hosting pkg. VLinteractive.com addresses customer privacy issues very seriously. We guarantee not to use or make available any personally identifiable information other than for administering your account. Each customer reserves the right to cancel and terminate its subscription with VLinteractive.com at any time. If the month that the customer decides to cancel his/her subscription is already paid for, the customer will not be entitled to compensation for the remainder of the given month. In case of the site cancelled and/or terminated clients can request site files, database backups etc. at additional fee. VLinteractive.com reserves the right to suspend and limit network resources to customers failing to pay the monthly fee in advance at it own discretion. In the event of service suspension, full service delivery will be restored within 12 hours from the date and time that payment is made to us. A onetime Site Restoration fee of CND $50 may apply to all sites restored from a suspended status. VLinteractive.com reserves the right to charge their customers for consulting services at the rates detailed in the shared and VPS hosting plans. Scheduled Maintenance refers to any maintenance in our data center of which the customers affected by any service disruption, are notified at least 48 hours in advance. VLinteractive.com will offer compensation to all customers affected by service disruptions caused by the Scheduled Maintenance in the form of credits. VLinteractive.com cannot be held liable in the event of service outages caused by direct customer actions. If a customer's actions directly result in service outage, VLinteractive.com will not issue compensation for this time. It is up to the customer to think of the consequences related to his/her actions. DNS service expirations, DNS legal disputes, deletion or edits of Web pages are examples of such mischief. VLinteractive.com reserves the right to charge their customers a standard consulting fee (time and material) depending on the type of service required for any time spent addressing issues caused directly by customer actions. VLinteractive.com technicians make backups of all websites and applications on all servers on a daily scheduled basis. We retail each backup for a duration of two weeks. © 2015 CFhosting.ca - Contact us for more information.